We’d love your help. Let us know what’s wrong with this preview of SHORT STORIES II by Rich DiSilvio. 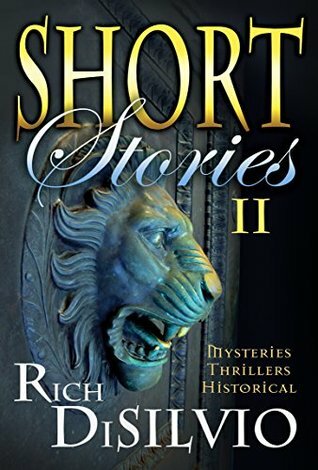 SHORT STORIES II by Rich DiSilvio features a rich collection of mysteries, thrillers and historical works from multi-award-winning author Rich DiSilvio’s past and present. Also included are three short narratives from his acclaimed Tales of Titans series. Included in this volume are two tales featuring PI Armand Arnolfini as he investigates intriguing art-related crimes, a SHORT STORIES II by Rich DiSilvio features a rich collection of mysteries, thrillers and historical works from multi-award-winning author Rich DiSilvio’s past and present. Also included are three short narratives from his acclaimed Tales of Titans series. Included in this volume are two tales featuring PI Armand Arnolfini as he investigates intriguing art-related crimes, a thrilling tale about John Vagis that will terrify and shock you, a moving and educational tale of two airmen during the Korean War, and others. To ask other readers questions about SHORT STORIES II, please sign up. New York author Rich DiSilvio, a man as committed to music, art, philosophy and sociology as informed by the fine arts, has previously takes periods of history with all of the fascinating changes, discoveries, triumphs and failures and by introducing some fictional enhancements within the stage setting of this era makes it far more credible. And in DiSilvio's handling of the parallel or concurrent unraveling of historical events with those of the textbook Dare to enter – the journey is rewarding! Short Stories II by Rich DiSilvio is an eclectic collection of tales ranging from the Roman era to the 19th century right up to the modern day. It includes short stories featuring Armand Arnolfini, a high-powered private detective with CIA connections who specialises in art theft and forgery cases. These are followed by the story of a man who appears in court due to a traffic offence, with a surprising twist - a tale so realistic one wonders if it is based on the author’s personal experiences. N Short Stories II by Rich DiSilvio is an eclectic collection of tales ranging from the Roman era to the 19th century right up to the modern day. It includes short stories featuring Armand Arnolfini, a high-powered private detective with CIA connections who specialises in art theft and forgery cases. These are followed by the story of a man who appears in court due to a traffic offence, with a surprising twist - a tale so realistic one wonders if it is based on the author’s personal experiences. Next is a harrowing story of a man who, after a road accident, is fully conscious but unable to move a muscle or communicate with his doctors or family in any way, after which follows an intriguing, thought-provoking tale of a Korean war aviator. The collection concludes with four historical vignettes or dramatisations where the founder of the FBI, the Roman Emperor Augustus, Guglielmo Marconi, President Roosevelt and Winston Churchill all make an appearance. A fine collection of tales with many twists and turns, surprising and informative revelations and passages that will make you pause to think. I thoroughly enjoyed the selection of Rich DiSilvio’s works which have been collected in Short Stories II. Well-written with a cast of extraordinary characters, it is a book that you will dip into time and again. Filled with good dinner party anecdotes, you will not fail to be enthralled by Mr DiSilvo’s story telling and penmanship. This is my first encounter with this author’s work but I will certainly make a point of looking out for his books in future. “Art is not what you see but make others see.” – Short Stories II: Mysteries, Thrillers & Historical is written by Rich DiSilvio. In The Phantom Forger, private investigator Armand Arnolfini is hired to find the scam artist who conned museum curators. But the trail of paintings reveals a startling discovery. The Russian Link takes Armand back into Hitler’s era when a painting is stolen at the opera. Getting a traffic ticket can lead to A Courtroom Calamity when you’d rather be working. Trapp “Art is not what you see but make others see.” – Short Stories II: Mysteries, Thrillers & Historical is written by Rich DiSilvio. In The Phantom Forger, private investigator Armand Arnolfini is hired to find the scam artist who conned museum curators. But the trail of paintings reveals a startling discovery. The Russian Link takes Armand back into Hitler’s era when a painting is stolen at the opera. Getting a traffic ticket can lead to A Courtroom Calamity when you’d rather be working. Trapped is how a man feels as he lies in a comatose state. Whiskey, Orange Blossom Specials, and cigars are what Roosevelt and Churchill enjoy while planning war strategies, becoming Saviors of the Western Civilization. “A picture is a poem without words.” – Horace. Rich DiSilvio’s collection consists of nine appealing stories laced with mystery, history, and wit. Stories like Object Lesson, which takes place in North Korea and Trapped will leave you in a pensive mood. I found references to some of the artists interesting, and also liked FBI: Charles Bonaparte. It tells how the FBI was started. Armand Arnolfini is a fearless, cultured detective that I would like to see in more art related whodunits. In Short Stories II, we are taken from one thrilling story to the next, including one that is quite chilling. Along Award-winning author DiSilvio continues to offer well written short vignettes with Short Stories II. If you're acquainted with his works you will be pleased with his latest publication. If you're a new reader of his, then you have some catching up to do! DiSilvio's talent is unquestioned and his ability to weave fascinating stories with efficient yet detailed writing is unsurpassed. This compilation is extremely satisfying on a whole, while each story has its own charm or emotional impact, such as "Trapped", which is thrilling and chilling. Meanwhile the two linked stories about Private Investigator Armand Arnolfini were very unique and gripping crime stories. It was nice to see how the first story flowed and merged into the second one. "Object Lesson" was also thrilling with an unexpected twist that smacks readers awake to this judicious Object Lesson. Awesome Collection! I have to say that I’m a big fan of Rich diSilvio work and always buy his books whenever they pop-up as a suggestion. And not once I felt disappointed. So, as you may have already guessed it, I can not praise the author enough. He truly is one of the most prolific authors out there, but every single book is well-written and teaches you a thing or two about history, politics, arts or philosophy. This Short Stories II book is a very good introduction to his characteristic writing style, so it is a I have to say that I’m a big fan of Rich diSilvio work and always buy his books whenever they pop-up as a suggestion. And not once I felt disappointed. So, as you may have already guessed it, I can not praise the author enough. He truly is one of the most prolific authors out there, but every single book is well-written and teaches you a thing or two about history, politics, arts or philosophy. This Short Stories II book is a very good introduction to his characteristic writing style, so it is a good way to start reading his books as you really get a feeling of what he is capable of doing. For the ones, like me, who already know his skills, it’s a confirmation that even in a short story, he can write a compelling story that is fascinating, intriguing and a learning experience. As I mentioned in my review of Short Stories, these books (and short-form literature in general) are a great way to introduce yourself to a new author. If their short stories make an impression, your time invested in an Short Stories II is the second volume in Rich DiSilvio’s work with short-form storytelling. As with the first volume, this book consists of a collection of original short stories, followed by dramatized accounts of historical figures pulled from the author’s Tales of Titans books. The stories in this collection cover a broad spectrum. From the art world we have stories on art forgery, as well as the black market for stolen art begun with the Nazi plunder in World War II. Drama plays out in another story of a seemingly routine traffic court appearance with an unexpected conclusion. A fourth story concerns a man in a coma and the right to life. A final story concerns two Korean War fighter pilots on a deadly mission. One final aspect of Short Stories II that I thought was great fun was the author’s use of an alter-ego, Silvio Riccadella, in a story that seems to have evolved from a separate art project the author did in conjunction with the Metropolitan Opera. Very clever! It was a perfect rainy afternoon diversion. Short Stories II Mysteries, Thrillers and Historical (Short Stories by Rich DiSilvio Book Two) by Rich DiSilvio is another great book full of suspense and history. Book two takes us through nine short stories starting with The Phantom Forger and ending with Roosevelt and Churchill: Saviors of Western Civilization. Each story comes with a new plot, and new character to get to know. DiSilvio is talented with his pen and has a way of creating his characte It was a perfect rainy afternoon diversion. A great collection of short stories, each as encompassing and thrilling as the last. The stories are all completely separate from each other, with their own different storylines and characters. What I really loved though is how much each one made me think. They really make you question the way people act and the situations that we find ourselves in. The story on the pilots in the Korean War is especially thought-provoking. To think that ordinary people just like me and you went through that is a A great collection of short stories, each as encompassing and thrilling as the last. The story on the pilots in the Korean War is especially thought-provoking. To think that ordinary people just like me and you went through that is almost unbelievable. A collection of short stories based on varied themes of thriller, mystery and history- a great combination to read and read anytime. The stories are short, interesting, easy to follow and engaging. Sometime long novels are too much and here is a way to take a break and read in small sittings, but still enjoy the depth and author’s perspective. Stories are unique, but some feel connected to provide continuity. Enjoy them as you read!